The United Church of Bacon is a real, legal church established in 2010. We are based in Las Vegas, Nevada and currently have over 20,000 members worldwide. We chose a funny bacon name to expose how wrong it is for society to give automatic respect and special legal privileges to religions. Is our saying we worship Bacon really any stranger than Catholics who say that communion wafers become the body of Christ? Unlike God, who is invisible, at least we can see Bacon. Bacon is demonstrably real. Our name has nothing to do with a rude term for police officers. We respect the police and our founder is a decorated veteran. 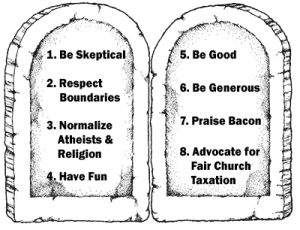 The United Church of Bacon holds to a list of 8 Bacon Commandments. We tried to make it 10, but ran out of space on the tablets and didn’t want to start over. We oppose supernatural claims. We are skeptics and atheists. In our religion, we doubt religion. We fight discrimination. Atheists and non-believers are not inferior and should not be hated and marginalized. We perform legal weddings, for member’s friends and family and always for free. How joyful! We praise Bacon! If you don’t like pigs, praise Vegetarian Bacon or Turkey Bacon. Held second annual United Church of Bacon revival at Burning Man 2014. Will you stand up for separation of church and state? To end discrimination? You can help! Get married. Want a fun, creative wedding with no God involved? Have a friend or family member get ordained! Our officiants can perform legal weddings and do not charge money. Perform weddings. Apply to perform legal weddings as a United Church of Bacon officiant! Donate to secular causes. We fundraise for a whole list of good causes. Listen to church services. Need inspiration? Our church services remind you that you are far from alone to be an atheist or skeptic! Contact us. And suggest some other way we can work together. We’ll be glad to hear from you! John grew up in Alabama and Mississippi in the 1960s, where witnessing civil rights violations inspired him to fight for minority rights. In 1971 he joined the Marine Corps and graduated at the top of his class in fighter jets as a Marine. After completing his active duty obligations, he spent 25 years flying for major international airlines, starting at Eastern, and retiring as a captain for United. He transported more than one million passengers safely to their destinations. In 1991, John was recalled to active duty, flew 52 missions as an F-16 fighter pilot in Operation Desert Storm, and was awarded six air medals, including the Distinguished Flying Cross for heroism in combat. John is an advisory board member of the Military Religious Freedom Foundation and received their 2011 Thomas Jefferson Award. Since retirement, John travels internationally, reads, and observes people all over the world. 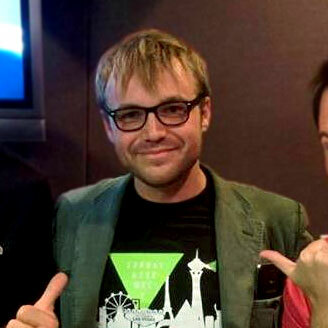 He is the founder of the United Church of Bacon, which began as a concept among a group of friends in Las Vegas in 2010, and became active when John began recruitment at TAM in 2012. The skeptics’ church has a serious intent, to fight religious discrimination against non-believers, to promote church-state separation, and to demand equal rights for everyone, regardless of faith. Read more about John. Heather is a professional burlesque dancer, singer, model, filmmaker, producer and co-host of the Ardent Atheist and Skeptically Yours podcasts. In 2012 Ardent Atheist won The People’s Choice Podcast Awards in the religion inspiration category. She currently is a member of Penn Jillette’s No God Band and is a vocal activist for atheism and skepticism. Read more about Heather. 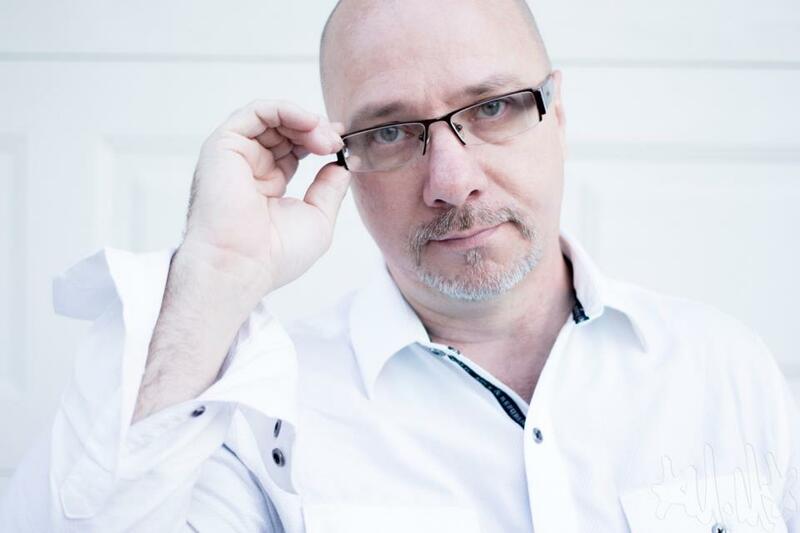 Emery is a 30 year veteran of stand up comedy with national appearances on Comedy Central and MTV. After touring internationally throughout the eighties and nineties, he was the host of radio show, “Mornings with Emery Emery & Rain” on KY102 in Kansas City. Emery is also a published author with “The Atheists Guide To Christmas”, host of award-winning podcasts “Ardent Atheist” and “Skeptically Yours”, and producer and director of numerous television productions: “Jake Johannsen: I Love You”, “A Year Without God”, and “Play Dead” to name a few and the editor of the critically acclaimed film, “The Aristocrats”. Read more about Emery. Kevin is a designer, entrepreneur, and community builder. He is co-president of Sunday Assembly Las Vegas.